Topics: Gallery, Brobuild Web Solutions, and Werelocal. 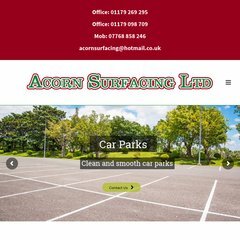 acornsurfacing.co.uk Driveways Bristol - Gloucester | Block Paving | Asphalt | Tarmac .. It is hosted by Provider Local Registry (England, London,) using Apache/2 web server. Its 2 nameservers are ns1.theuggroup.com, and ns2.theuggroup.com. Acornsurfacing.co.uk's IP address is 83.170.113.83. PING (83.170.113.83) 56(84) bytes of data.